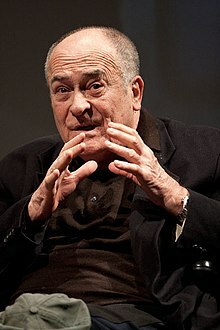 Bernardo Bertolucci (Italian: [berˈnardo bertoˈluttʃi]; 16 March 1940 – 26 November 2018) was an Italian director and screenwriter. His most well known works were The Conformist, Last Tango in Paris, 1900, The Last Emperor, The Sheltering Sky, Stealing Beauty and The Dreamers. In 1979, he was married to screenwriter Clare Peploe. until 2018. ↑ "Bernardo Bertolucci". Front Row. ↑ "Oscar-winning director Bertolucci dies". 26 November 2018 – via www.bbc.com.